Attended by: Mayor of Nottingham. 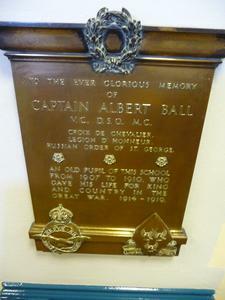 Rectangular plaque with raised inscription below a cast wreath, with three embossed roses in the centre of the inscription, and with the RAF badge and High School Badge on the lower border. 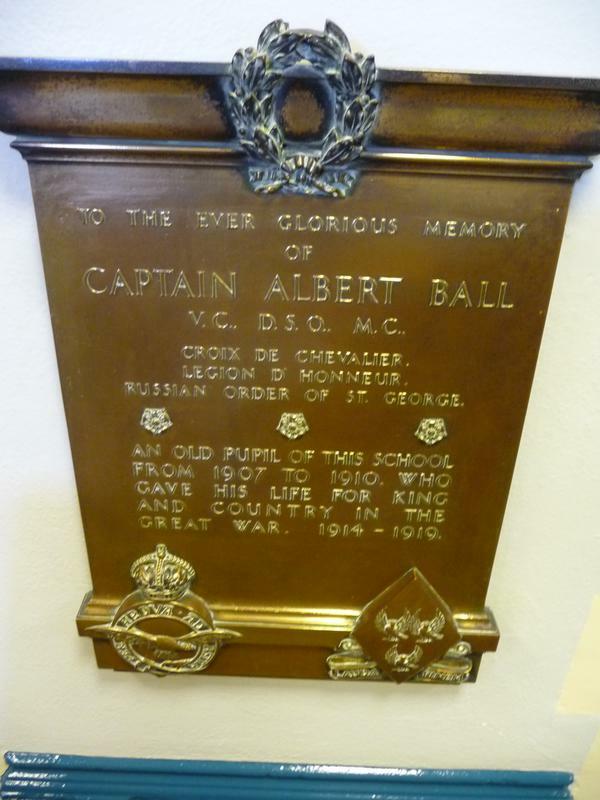 TO THE EVER GLORIOUS MEMORY/ OF/ CAPTAIN ALBERT BALL/ V.C., D.S.O., M.C./ CROIX DE CHEVALIER./ LEGION D'HONNEUR./ RUSSIAN ORDER OF ST GEORGE./ OLD PUPIL OF THIS SCHOOL/ FROM 1907 TO 1910, WHO/ GAVE HIS LIFE FOR KING/ AND COUNTRY IN THE/ GREAT WAR. 1914 - 1919. Information shown: Rank, forename, surname, decorations, school dates. Nottingham Evening Post. Thursday 12 July 1923.